Atlus has announced they're guaranteeing server support for Demon's Souls unique online features until sometime next year. Originally, server support for From Software's rock-hard PS3 adventure game was only guaranteed until October of this year, after which publisher Atlus could pull the plug whenever it felt like it. 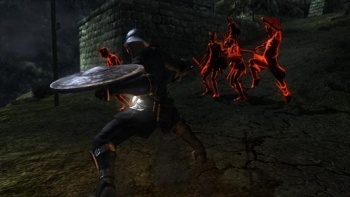 While you don't need to be online to play Demon's Souls, and there's certainly enough offline content to warrant the $19.99 asking price, the game will be poorer without it's unique social components. Currently, players in Demon's Souls can leave messages both deliberate and accidental - either as little notes, or in the form of blood stains that show an unlucky player's last few moments of life. This leads to more than a few cases of death by schadenfreude, as you're often too busy laughing at someone being pushed off a ledge to notice the death knight sneaking up behind you with a wicked glint in his eye. Players can also recruit other players as blue spirits to help with difficult areas or, conversely, less socially minded players can invade other people's games and try to murder them. One of the game's bosses isn't really a boss at all, but another player plucked from the server for you to fight against. This quirky player interaction is part of what makes Demon's Souls so interesting - well, that and its malevolent difficulty curve - and sadly, it's not going to be around forever. "While the reality is that one day the servers will ultimately close due to operation and maintenance costs," says the Atlus press release, but it goes onto add, "that day is not today."